May 16, 2006 -- The image that used to be here has been removed indefinitely. Keep checking back to see whether it returns. Just as with the Gary Larson "Far Side" cartoon here, this one is an example of how a cartoonist can tell a story without using a lot of ink. Take a moment to study it before you read the caption. We know right away that we're looking at a large passenger airplane even though a fairly small amount of ink was used to depict only a small part of the whole. Because it's tilted nose up we know that it's in the air. Would every cartoonist think of that? And of course we see that the top of the cockpit has been sheared off by, presumably, another aircraft. That's a lot of information to convey with so little expenditure of ink. At first glance, before you read the caption, your eyes are drawn quickly to the cockpit and the pilots. Only then do you realize there's something in the air behind them. The fact that object is not obviously a hat -- it could be a lawnmower or an alien spaceship or merely an irrelevant piece of debris -- just adds to the "Aha" feeling delivered by the caption. It is said that the hallmark of a good joke is the unexpected resolution of a hidden dilemma. 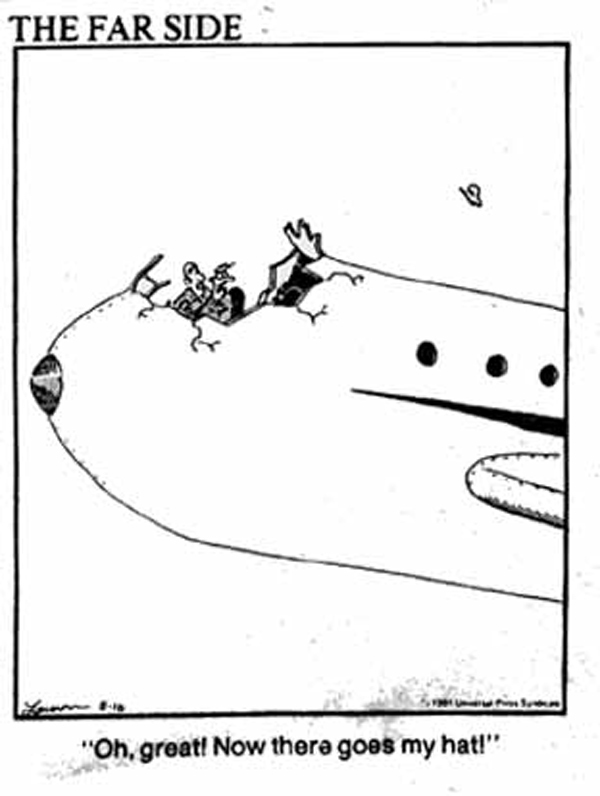 This particular cartoon is shown here as a terrific example of a cartoon that revs us up with an apparent disaster, then relieves us in a hilarious way when we get to the caption. If you want to learn how to write good one-panel cartoons, this one is worthy of your study, not only for the inherent humor of the caption but also for the terse yet fully informative artwork. One criticism is that you have to look pretty carefully to see that one of the pilots still has his hat on, and another criticism is that it's hard to tell which one is speaking. Still, I think this particular comic is so good in so many other ways that I hope it will inspire you (especially if your name is Augie) to bear down and try harder to create comics just as good using so little ink.